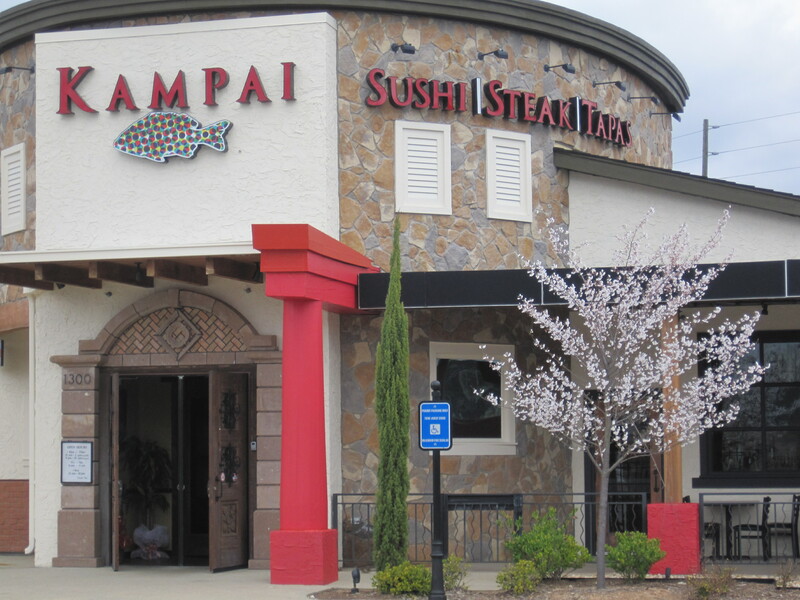 Kampai is a small chain, with locations in Duluth and Lithonia, whose focus these days is on steaks, sushi, and tapas. You don’t need to take my word for it. It’s on the side of the building of their new location in Lawrenceville, in the same plaza (Avenue Webb Ginn) that houses Ted’s Montana Grill and Red Robin. Kampai is in the building that used to house On the Border, and they’ve done nice things to the inside. It’s a good looking place. There is a lot of black stain, natural wood finish, and brick, and a decent number of flat screens. Though I arrived at lunch, after commenting on the lack of useful selection on their lunch menu, I ended up with their dinner menu. This menu is pretty large, with two pages devoted to various tapas and three pages to sushi rolls alone. This doesn’t count the extensive coverage of tempura dishes and also their hibachi meals. I’ve never been a huge tempura fan and hibachi would be dietary overkill. I focused on sushi and tapas, looking for items I could eat. 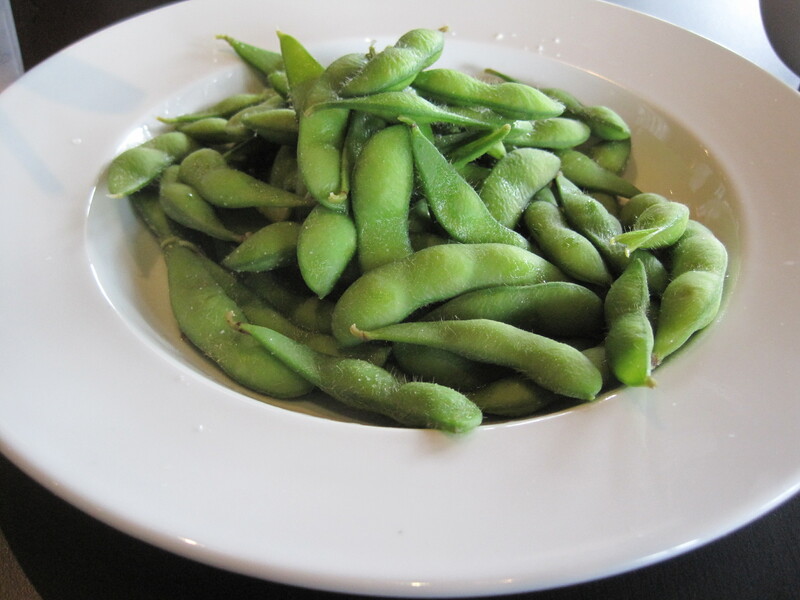 I rapidly found the edamame, which I ordered and their braised pork belly on sauteed tofu. Along with that I ordered salmon nigiri and salmon roe nigiri (or so I thought) and also what they called a diet roll. There were no tapas available that had just a vegetable. I would have liked some steamed greens, or spinach, or bok choy with my meal. The edamame came out steamed and the serving was large. I was very appreciative of what I was offered. The pork belly was smaller than I expected, looking a lot like a thick cut slice of bacon cut into squares and placed on a bed of tofu. Still, fat is a luxury I can afford. The flavor was good and the tofu welcome. The nigiri ended up sashimi instead. It wasn’t what I expected but this was rather a welcome mistake. The foods were on mint leaves and then placed on what looked like daikon slivers. Both were fresh and flavorful. The diet roll was just okay. Edible yes, but no mind blowing flavors. I would have dropped this if there were a single steamed vegetable tapas, but no such luck at this time. In retrospect, this small chain seems to do well on the edges of the metro area. 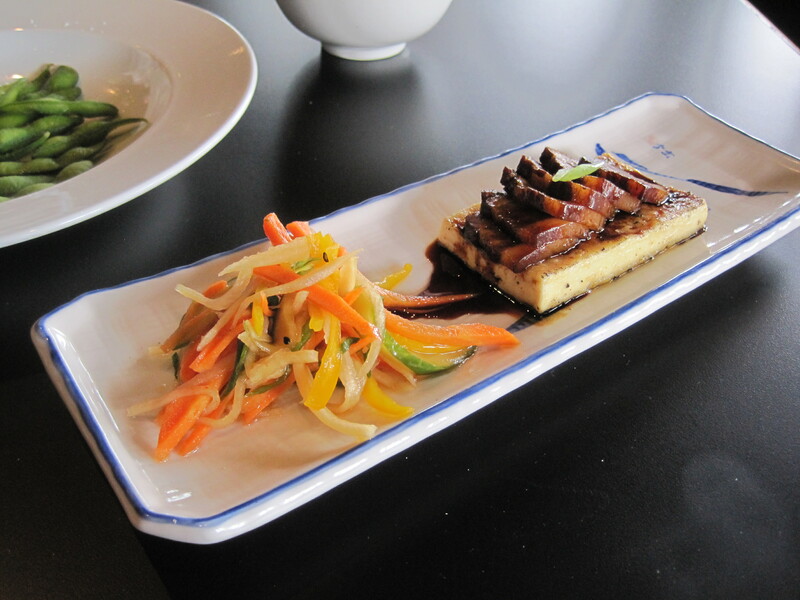 The style of the place, to cater to many different trends in the industry, is similar to Sakegura and indeed, Nakato. It’s not as popular the closer to the city you get, as people seem to want specialized eateries in places like Buckhead and Midtown. But it should do well in the Avenue Webb Ginn mall area. It has a nice upscale look. When I showed, it was attracting Asian and American clientele. With the local Urban Flats shut down for the time being, it fills a niche for better dining in the neighborhood, and it is far quieter than Bonefish. I like its chances, and wish this chain the best. Verdict: Versatile upscale dining in the Avenue Webb Ginn area. Highly recommended. Notes: There have been many behind the scenes conversations with Mike Stock (Gadget Geek) about the Avenue Webb Ginn area. He was the one who pointed out to me that Urban Flats was closed, among other things. I’m so glad that you eat this and write about it. It is beautiful to view (and I LOVE your photos), but I can’t imagine actually eating this type of food. I’m sure it’s part curiosity on my part, and part exposure through my wife and mother-in-law. Some things though are more fashion than truly fancy: edamame is just a bean, as are black eyed peas. You can get edamame in the frozen food section at Publix. Pork belly is the cut of meat from which bacon is made, and so forth. I’ve tried edamame but not in a restaurant, so I would try that. Publix also has it in the produce section. It really is gorgeous food, I’m just a typical American who likes food cooked lol. There are some cooked sushi: tamago (egg) sushi, for example. Shrimp sushi also comes to mind. I was also excited when this place open, I thought I dont have to drive into Atlanta to eat at a fairly nice place. Since Kampi have open I must have eaten there 4-5 times. I had also told other folks and planned to have a few dinner meetings there. My company has been using Bone Fish for meetings, so this was a good option for us. 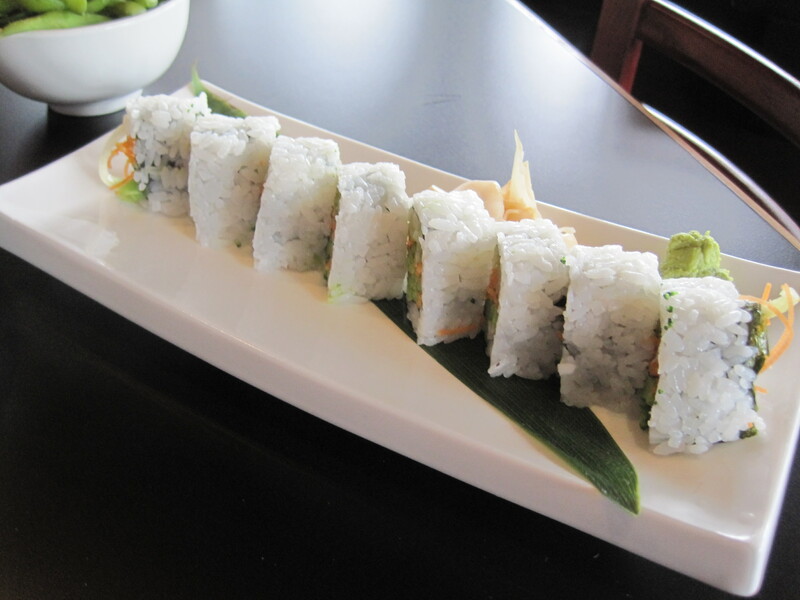 On my last visit I had a yellowtail roll, the seaweed was tough and very chewy like leather gum. I told our waitress who procceeded to report to the manager/owner. He was obviously not pleased with my critique. Rather than remaking the roll or credit my tab for a bad roll he sent the sushi chef over to explain and show me what happens sometimes with sushi, and the reason why this particular roll was so chewy. 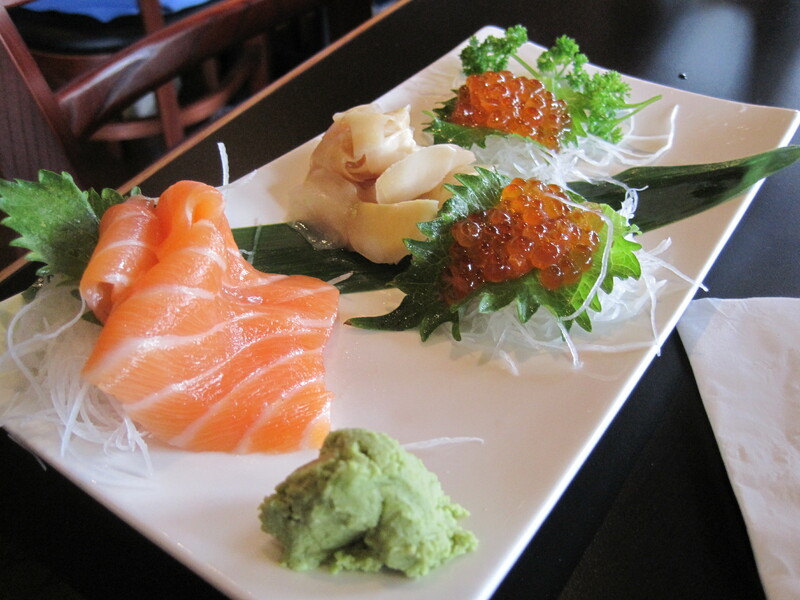 I love to eat, I have eaten in some of finest places around the country and I know good sushi when I taste it. This simply a bad roll, which I had no intention of holding it against them. All they had to was the right thing! Obvously they do not believe in costomer satisfaction. So They have lost my business! Deal with sushi chefs is that with few exceptions they’re hardly expert at English. I’d be careful blaming the restaurant over something like this, but to each his own! I wasn’t impressed with this place. It looks nice, but the food is just okay at best. It’s definitely not worth the expense – and it is expensive. There’s equally good hibachi available at several other restaurants nearby, and at a fraction of the cost. There’s also far better sushi available at another relatively new Japanese restaurant just down the road. They did a nice job of interior decorating, but I’m not willing to pay a stiff premium for mood lighting and a few extra ounces of stain on the tabletops. Well I had an experience that I will never forget on 5/14/2011 .Myself ,my wife and son went to have a nice dinner but we got a bad cook we got all of our food burned ,,Talked to manager he did nothing so we paid the bill ,,But will not be back ..also the 2 other couples complainted to no avail .. I ate all I could with heart burn from the burned food ,,The chef even burned the eggs ,,I should have left then but was hungry all day out in the sun during a Track meet….